I've been at this job for 10 months now. I have a better handle on how I want to dress for the job I really love. So after the last few months of wearing jeans, denim leggings and ponte jeans with a variety of sweaters, tops, blouses and toppers, I'm so ready to wear a dress. Last year I made a lot of maxi dresses. Dresses that I'm thrilled to have in my wardrobe for this spring/summer. However, I really love to wear dresses and skirts and I've finally worked out how to make those garments function in my job environment. I've also realized that I'm going to stand out a bit but it's okay because I'm a member of the team now. I've worked hard to be respected so they will see that instead of just seeing what I wear. So dresses! I'm sooooooo excited! I even wore two to work last week with stockings. I think the key is not to wear and accessorize them the same way that I use to. The last 10 months has provided me with the opportunity to change the way I looked at my clothing and how I wear it. The first two are shown above. They are simple sews. Made using my new TNT dress pattern. What makes them different is the ponte fabric I used. I even used some of the same techniques I've used in past dresses ~ dresses that no longer live in my wardrobe. and thought they would work with this dress. There are no new construction techniques. As I stated above it was a simple sew. I added short sleeves with a band. I will wear it with a black cardi at work because the office is always slightly chilly. This was the most challenging of the two dresses because I decided to cut the stripes both horizontally and vertically to add interest to the dress. Honestly working this out made my head hurt but I got them cut out. I used old pattern pieces from my now out-of-date TNT dress pattern so I wouldn't have to reinvent the wheel. Though I don't know how much time I actually saved since I still had to refigure everything to work for this body. The pieces were cut out singly. 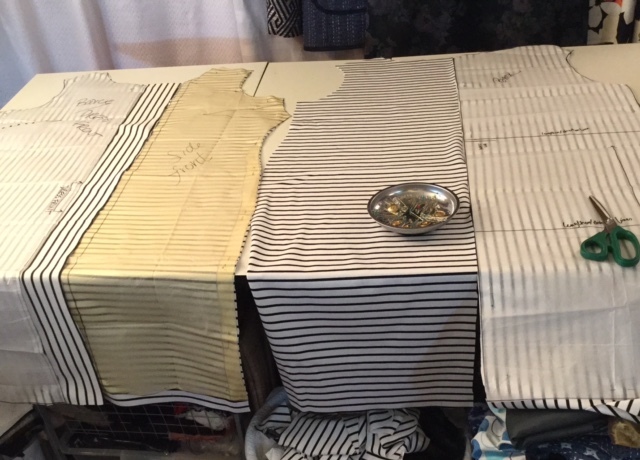 I then laid the pieces on the cutting table in the order I wanted them to flow around my body. I did this to make sure that everything worked. I constructed the dress this way also. So the back pieces were put together first, including the invisible zipper, then the side seams were sewn. Matching the stripes on the one side was also important to making this dress work. The final embellishment to make the dress work was adding the black foldover braid to the neckline and armholes. I'm wearing the dress with a bright yellow RTW sweater because I wanted to add some color to the outfit and I will be wearing it this way IRL. These were the last makes but I'm blogging them first because...well dresses! So these are actually Outfit 3 and 4 in my "Chicos Chic Spring Wardrobe Plan." However, I have a stack of patterns ready to use to make more spring/summer dresses so I won't be using my TNT pattern much this summer. I just started here and am branching out because hey it's spring and I can wear dresses again! I am loving you new dresses. They are both fabulous! 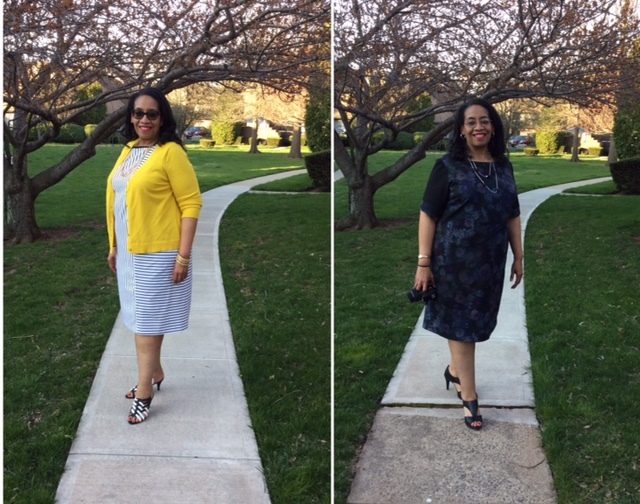 I think the yellow RTW cardigan gives the dress just the right pop of color. I am looking forward to seeing more of your new Spring pieces. Ok, now that's you and it looks good too! Dayum, that is fine stripe work. I like both dresses, but the striped one is a fave. How do those sandals stay on? Is there a clear heel strap? They are just slides so they are easy to wear and easy to walk in! Wonderful dresses! Love the stripes. Both dresses are great-also love the stripe matching . Such a nice compromise to all horizontal stripes - but it adds great visual interest . I love your new dresses and the fact that you wore them with stockings! Nothing makes a gal look more polished than that. The striped dress might have done your head in, but it is so worth it. Love both dresses and I am curious how you wore them to work. Sharon - I will post a pic to Instagram so you can see how I wore it to work. You look great! Particularly like the striped dress and yellow cardigan look. I love the print ponte dress with the black sleeves. It's so nice to see you sewing dresses again. Your dresses are always an inspiration. Lovely dresses! It's nice to see you back in dresses. I particularly like the dark ponte dress but they're all nice. I do love your sandal/shoes but I don't think I could walk in them! They look great with your dresses. Caroyln, can we take a moment of silence, because you slayed this stripe dress, yes, indeed! I love it, gorgeous! nice dresses and cute shoes! Love these dresses! It's nice to see you in this type of outfit again! The stripe dress is great, love the way you used the fabric. Both are lovely dresses and you look great in them. Love those black shoes too. I'm in agreement with the stripe dress being my fav! I like the mix-up of direction and that yellow gives it a pop of sunshine goodness! Oh yeah and those shoes finish that look. Lovely! I always enjoy seeing your "makes!" Thanks for blogging! both great dresses but that stripe one is beyond fantastic, love it. I like the striped dress with the yellow cardi! What a fun look! But I can see how both would be great for dress up/dress down wear. Now these are cute. While you can never go wrong with stripes I think the floral is my fave. I love the darkness that the violet and blue hues share with the black but are still rich in color. Very nice! I love what you did with the stripes! Those stripes are a knockout! I also love that you're feeling part of the team, and can now branch out a bit fashion-wise and be yourself. That's gotta be a happy place! Loving both dresses but really appreciating your footwear! Great styles. When I saw your striped dress I actually thought the stripes were 2 different colors (light blue and dark blue); I chalk it up to tired eyes. But now, I am inspired to try it out. Thank you! I love, love, love the stripe ponte dress!!!!!! Fabulous work on both! Marrie - copy away!!! I'm sure yours will be even more striking! Stunning! Especially with the yellow cardigan. I think you look impressive and professional in both dresses. The black & white stripe is my favorite especially with the yellow cardigan. Stripes with yellow - such a refreshing colour scheme. Lovely. Great dresses. I love the way you have placed the stripes. I love your yellow cardigan where can I buy one? You look very stylish. Mandy, I bought that sweater from QVC from the Isaac Mizrahi line last summer. I'm sure you can find something similar from there. www.qvc.com and check out Isaac Mizrahi's line. I too am suddenly in the mood for a dress or two for this spring and summer. I took a snoop shopping pic of a top with stripes last month and then you went and put that gorgeous one together to remind me how cool that look is. Both are lovely but that pop of yellow just made me smile. Love, love, love the striped dress! You're my inspiration. The dress is just perfect! It's so wonderful to see you back in dresses!! You look fabulous 😍 it's been interesting to see you adapt to your new work situation, and try different styles, but I'm relieved to see you've found a way to bring back the styles that YOU love to wear. Better to be "overdressed" and confident in yourself, I think.